Follow our complete, step-by-step, photo illustrated recipe to make this delicious, old southern favorite, Corned Ham. We’ll salt and brine a fresh ham for eleven days, then roast it in the oven to bring back the great flavors of the past. Printable recipe included. How To Make Corned Ham recipe. 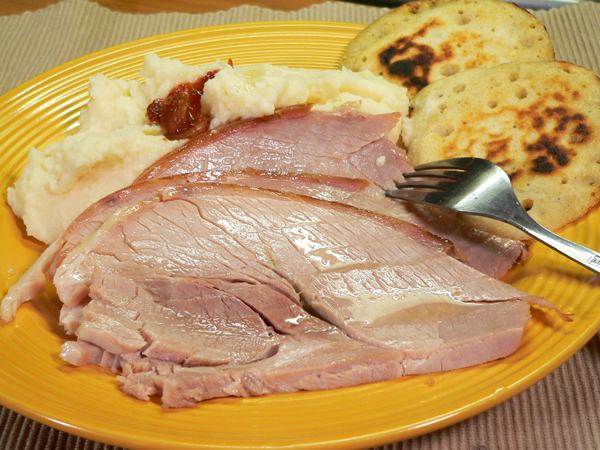 If you love what we call Country Ham, you’re going to love Corned Ham. It’s got a unique salty flavor that comes from the fact that it goes through a short cure process of a salt brine that takes 11 days to complete. Your typical smoked Country Ham will go through a cure process that takes several months, up to several years before it’s cooked and served. I don’t really have any memories of Mama or Daddy ever making a Corned Ham, but after tasting it, I realized that it seemed to be something I had tasted before. Since we raised our own hogs for numerous years while I was growing up, it’s highly likely that Daddy would have made a Corned Ham and that I just wasn’t aware of it. While watching the Christmas Special for a program on PBS called “A Chef’s Life,” back around 2016, I became aware of the Corned Ham and knew I wanted to try it. Just a few days later, I discovered that a grocery store about 30 miles away was advertising them for sale. Seems they only have them right around Thanksgiving and Christmas. I purchased a ham shank that had been corned and cooked it that year. It was a bit salty, more so in some parts than others, but I recalled the taste from years past. I knew that I wanted to make one next. I must give credit to Chef Bill Smith from Crooks Corner restaurant, up the road from me in Chapel Hill, NC for the recipe and instructions. Bill talked about making a Corned Ham during the above mentioned Christmas special. He serves corned ham at his restaurant from around Christmas to Easter each year. I also found a recipe for a Boiled Corned Ham in a cookbook (1986) entitled “Old Carolina Tobacco Country,” that I purchased at an auction some time back. The book didn’t tell how to actually make the corned ham, but it said older folks use to boil the hams in a black, cast iron wash pot. Once done, it was removed from the water and then collards would be cooked in the same water. Just remember, you need a FRESH ham to begin with. Smoked, cured, or cooked hams will not do. Check with your local butcher. If they don’t have one already, perhaps they can order one for you. Also, try to get one that wasn’t previously frozen. 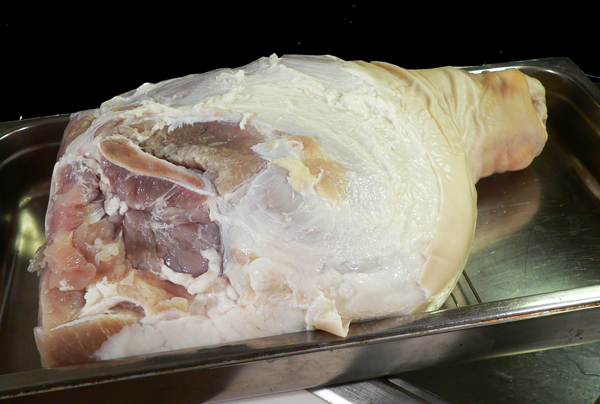 Basically, you rub a fresh ham with salt, then cover and refrigerate it for 11 days. You remove it about every four days to drain off any liquid, rub on a bit more salt, then return it to the refrigerator. 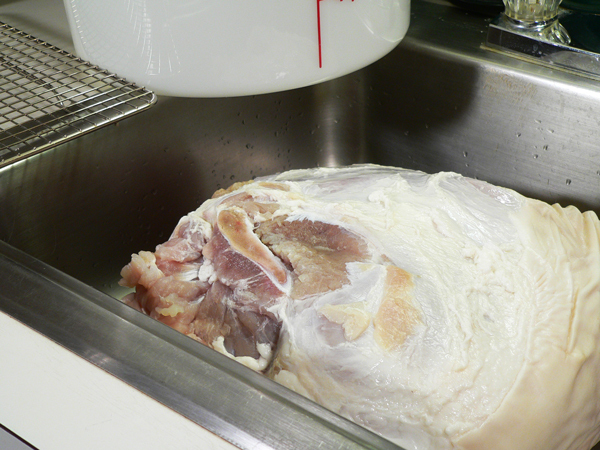 After 11 days you rinse the salt away, cover the ham with water and soak it overnight. It’s ready to cook after that. So, I trust we’ve caught your interest as well. I’ve adapted this recipe slightly. Bill suggests removing the cover and letting it brown for an hour at a slightly higher temperature, but I didn’t think mine needed to go that long. Thirty minutes seemed enough for what I cooked and it was still browned nicely. This was my first attempt at making one of my own and I was really pleased with how it turned out. I think you will be too should you decide to make one. Ready to give it a try? Alright then, let’s get in the kitchen, and… Let’s Get Cooking. Old Fashioned Corned Ham, you’ll need these ingredients. You must start with a FRESH ham. You can not use a smoked or cooked ham, it has to be fresh. If you can’t find one at your local grocer, ask if they can order one for you. It’s best to use one around 15-20 pounds in weight if possible, and one that hasn’t been previously frozen. The only one I could get weighed in at a whopping 25lbs. A bit larger than I wanted, but I went ahead and purchased it. 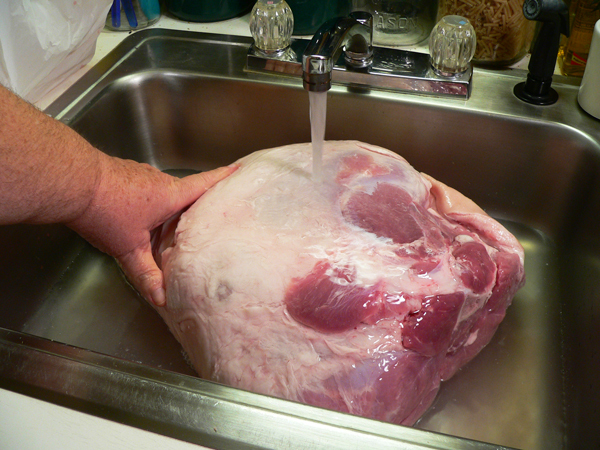 Rinse the ham under cold running water. Trim away any excess fat or skin. You’ll be able to tell what should be removed once you start looking. Sometimes you’ll find a flap that is connected at one end to the ham and sort of just laying over on the rest of the meat. Remove and discard it. This is the skin side of the ham. Note the larger fat pieces that I’ve already trimmed away on the left of the photo. 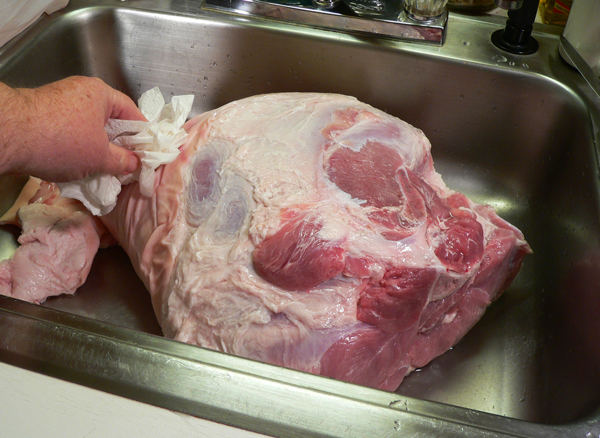 We’ll leave the skin on, removing only any flaps that might have been left on when processing the ham. 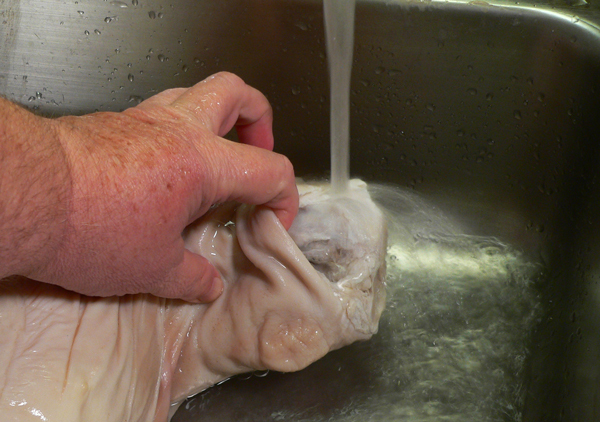 Pat the ham dry with some paper towels. 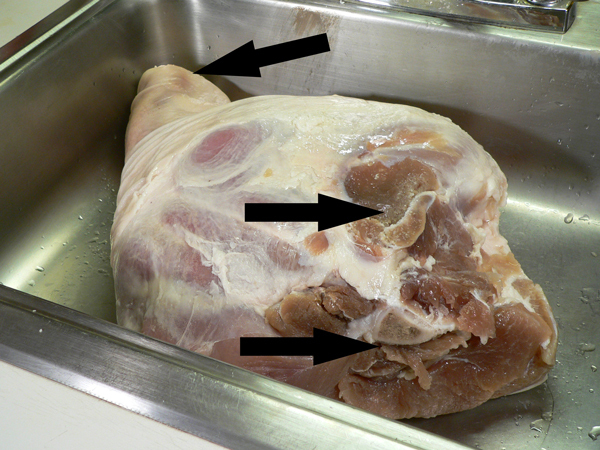 There are three points on the ham that you will need to cut an incision in. They are all right next to a bone and are pointed out in the photo above. 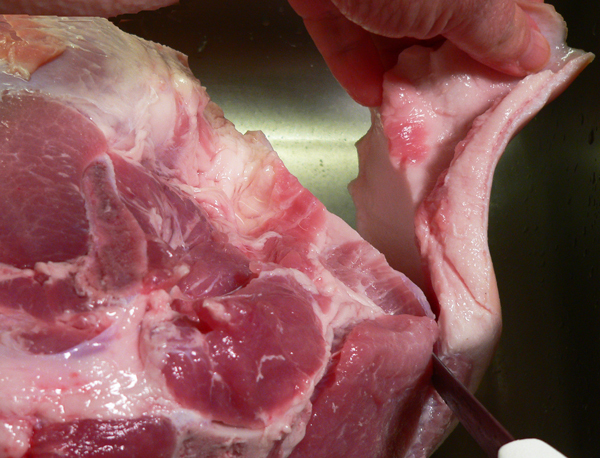 You’ll place an incision right beside the bone in the hock end pictured on the left and next to the two bones that are visible on the rounded end. Each incision will be about three inches wide and as deep as your knife wants to go, which would be about 6 to 8 inches. 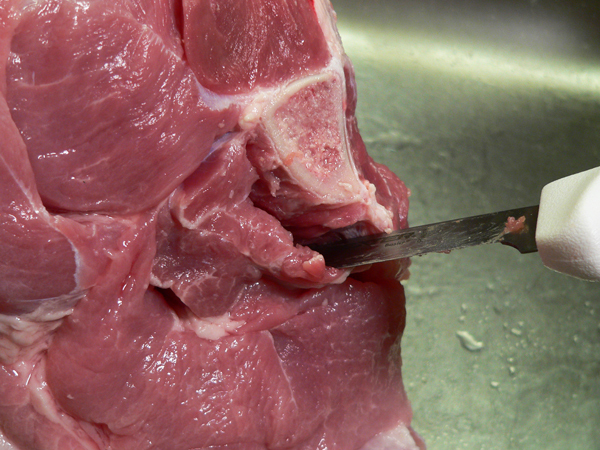 Use a sharp knife and cut right next to the bone visible on the rounded end. Cut it about three inches wide, and as deep as your knife will go, basically about 6 inches deep. We’re going to pack these incision points with salt to help brine the ham. Incision point two is a little further down on the rounded side. Again, cut it about three inches wide and about six inches deep. 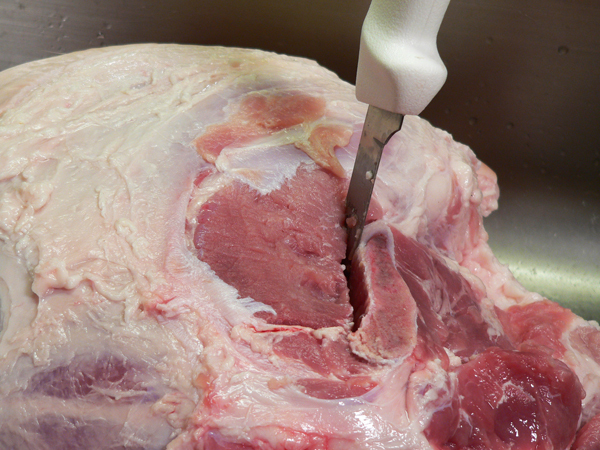 Incision point three is on the “hock” end of the ham. Cut between the bone and the skin, as there isn’t much meat at this point. Try not to cut the skin as you do this so it will hold the salt when applied. Pack the incision points with a good amount of the salt. Just keep adding it and pressing it into the incision as it fills up. 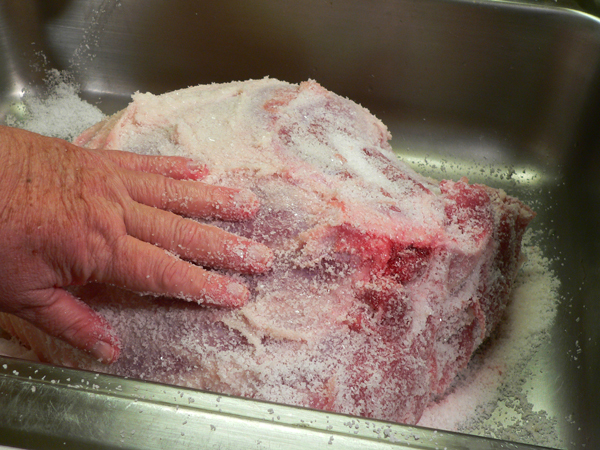 The salt will begin to dissolve immediately, so just keep working it in until the incision is filled with salt. Do this at all three points. Pack each incision point full of salt. 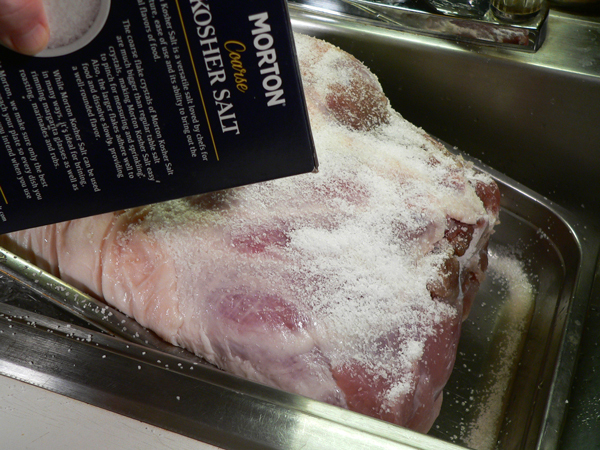 Sprinkle a coating of salt on the outside of the ham. Use your hand to rub the salt all over the ham. You don’t want to pack it on thick, just make sure you have it fully coated. Flip it over and rub salt all over the skin side as well. 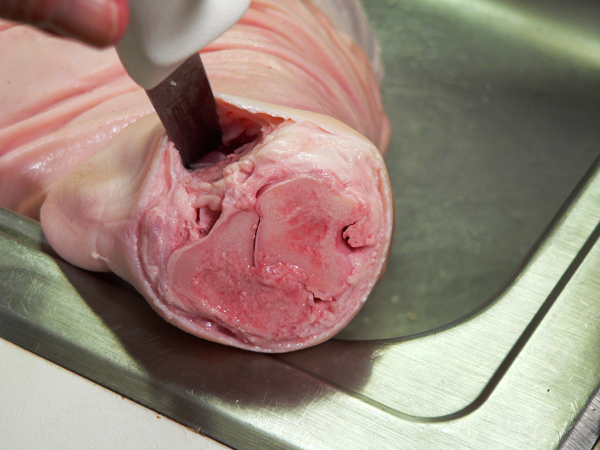 It will not stick to the skin as easily as to the meat side, but do your best and coat the skin side too. Place the salted ham in a NON-REACTIVE PAN. You must use either glass, stainless steel, or some type of non-reactive pan. I’m using a stainless steel restaurant type pan for this one. The salt will eat away at aluminum so be sure you aren’t using that or anything else that isn’t considered non-reactive. Wrap the whole thing in plastic wrap. Then, wrap that in aluminum foil. 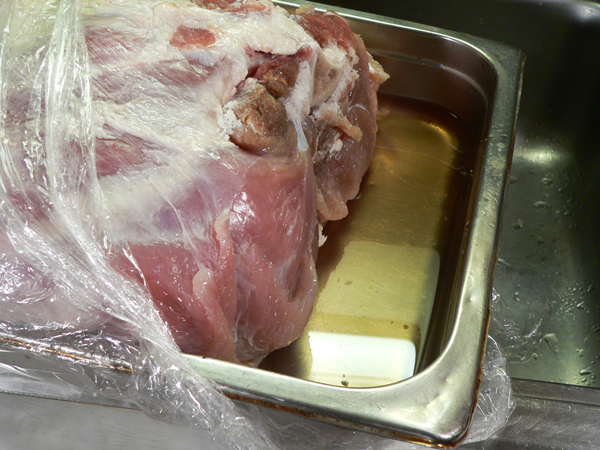 If you don’t use the plastic wrap first, the salt will quickly eat through the aluminum foil and could add some undesired tastes and chemicals to your ham. You don’t want that to happen. Smile. Place the wrapped pan in your refrigerator for 11 days. 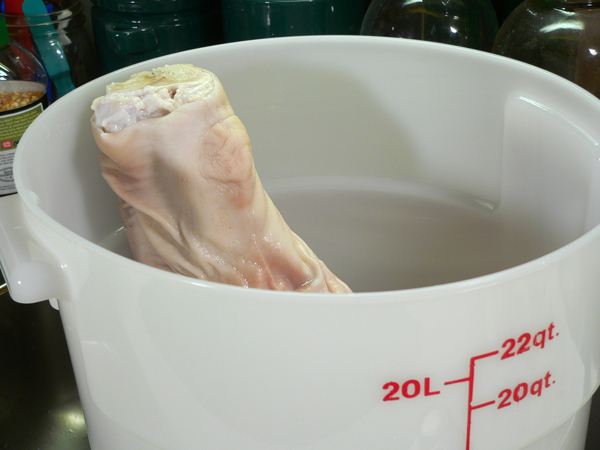 The ham needs to be refrigerated so the salt can do it’s thing to brine out the ham. You will need to check this every four days to drain off any liquid that will be produced and to lightly apply more salt to the ham as follows. DAY 4: Drain off any liquid that has accumulated in the bottom of the pan. 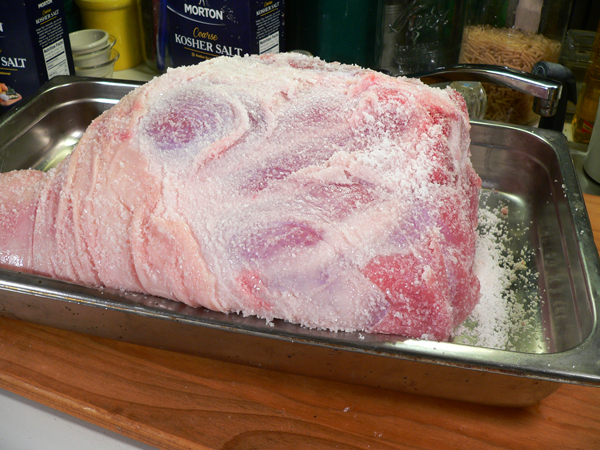 Apply a light coat of salt to the outside of the ham, and a little more salt into the three incision points. You don’t need to pack them full, just add a couple of more Tablespoons of salt. DAY 8: Repeat the same process as on day 4. Day 12: Remove the ham from the pan. Rinse well, soak in water for 24 hours prior to cooking. Here’s what to expect on Day Four. The salt will pull liquid from the ham. Just drain this off as best you can. Add a little more salt and rub it all over the ham once again. Place a couple of Tablespoons of salt inside each incision that was made. 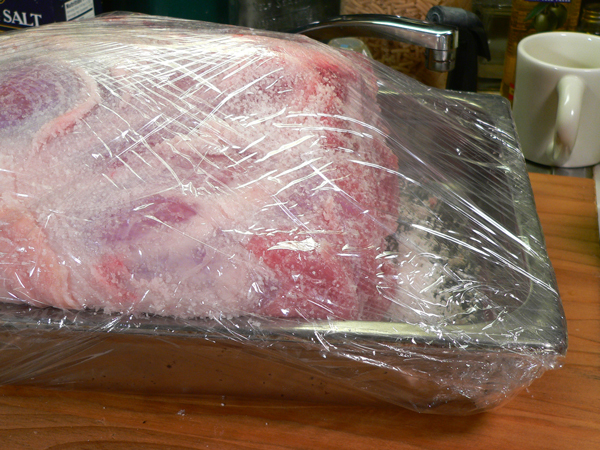 Cover the ham once again with plastic wrap, then with foil. I did completely remove the plastic wrap and foil so I could drain off the liquid and add more salt. I placed a clean layer of plastic wrap but was able to reuse the foil. Repeat the same process on Day 8. Drain off any liquid. Apply another thin layer of salt to the outside and another couple of Tablespoons to the incisions that were cut into the ham at the beginning. After being in the salt brine for 11 full days, we can now proceed with the next step. This is what to expect after 11 days in salt. The meat will have a darker color at this point, but that’s not a problem. Rinse out the salt pockets. 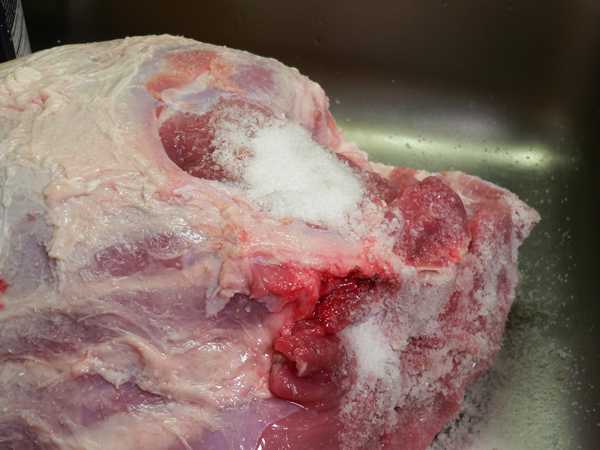 Use cold running water as you open the incisions where you placed the salt. Rinse these places out really good to remove any excess salt. 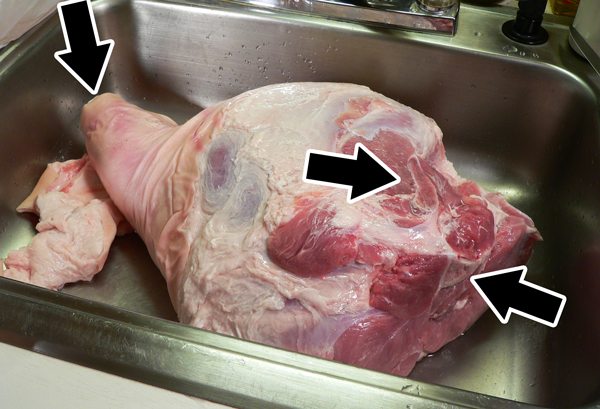 You’ll find that the meat has pulled back away from the bone and “pockets” have formed where you made the incisions. Again, rinse these out really well. Rinse out all three of the pocket areas where you placed salt. Rinse the outside of the ham really good too. Flip it over and rinse any salt off of the skin side. Place the whole ham in a food safe container. Cover with water. You’ll need a large container for this part. I’m using a 22qt food safe plastic container like we used in the restaurant business. It still wasn’t large enough for me to completely submerge my ham in water. I had about 8 inches of the hock end of the ham that didn’t get covered with water. I did fill the pocket at that end with water, so I think that helped a bit. You’ll still need something non-reactive for this, so select wisely. Fill this container with cold water, covering the ham, and place this in the refrigerator for 24 hours. This will help remove some of the salt so the ham will not be too salty to consume. 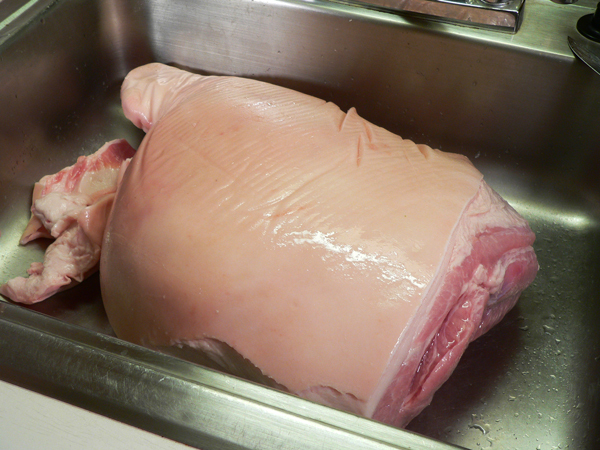 After the ham has soaked overnight, remove it from the water and rinse it once again. 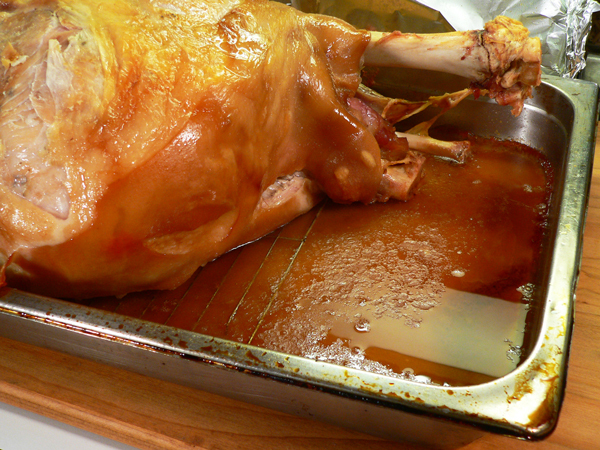 Place the ham on a roasting rack and in a large roasting pan. I’m using the same pan that I used to brine the ham and a small wire rack that I had available. If you have a roasting pan large enough to hold your ham, you’ll be doing good. Better than me for sure. Smile. They do make larger pans like this but I don’t have one of those. Restaurant pans aren’t cheap. I actually borrowed this one from my brother since he had a couple on hand. It would have been even better if I had a lid for it. The ham needs to be covered while it’s in the oven. A simple tent of foil would suffice, but I wrapped mine up tight. 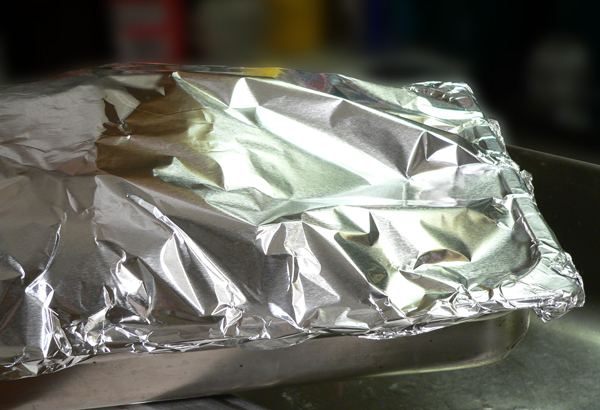 It IS aluminum foil, and there was still enough salt on the ham to actually eat a few pinholes in the foil after it stayed in the oven and cooked. Not really desireable, but sometimes you have to improvise. Smile. Place the ham in a oven that has been preheated to 325F degrees. The ham will need to cook at this temperature for about 20 minutes per pound. That means my 25lb ham, will need to cook for about 500 minutes. 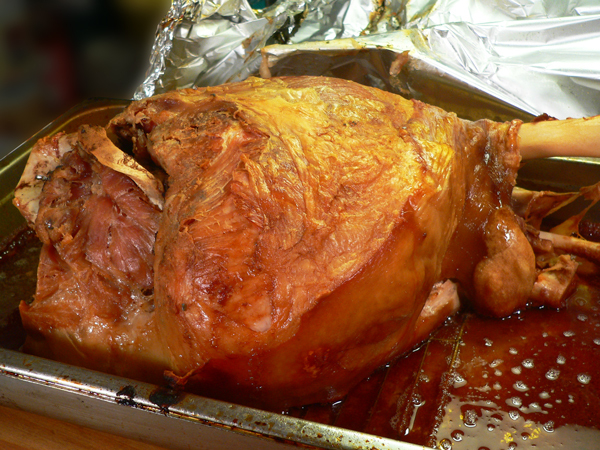 (20min x 25lbs = 500 minutes) Divide the 500 minutes by 60 minutes per hour, and the ham will cook for 8+ hours. Whew, that’s a long time. Just plan accordingly. This is what it looks like six hours later. The temp was showing part of the ham was done, but not the thickest parts. 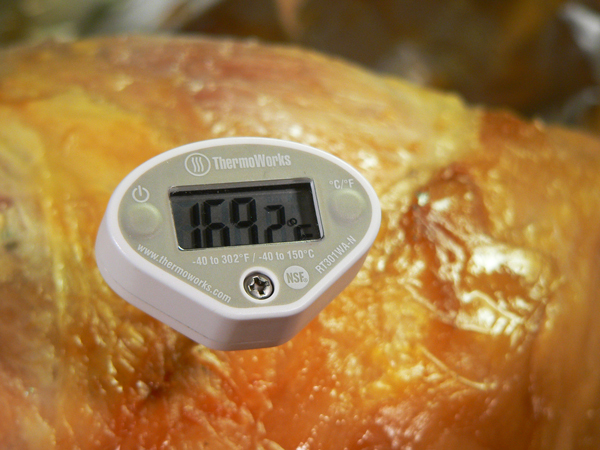 I always suggest that you use a good digital thermometer to check for doneness. They are much more accurate and will generally give you a reading in just a second or two. We’re going to want to save this liquid to make some gravy for sure. 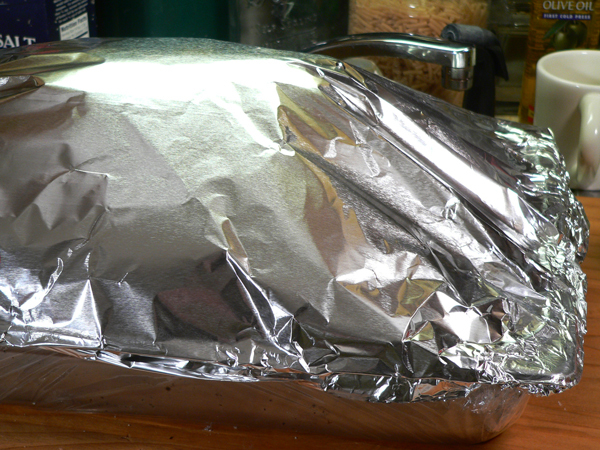 Remove the foil once your ham is almost done. Return it to the oven, uncovered, and let it brown for about 30 more minutes. This is after about 7 hours of cooking. At this point, the outside was browned and crispy. Maybe a bit too crispy for my personal taste. However, I let the ham cool and placed it in the refrigerator overnight again before I cut it. The outside wasn’t as hard after that, so all turned out well for me. 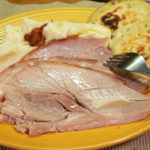 Follow our complete, step-by-step, photo illustrated recipe to make this delicious, old southern favorite, Corned Ham. 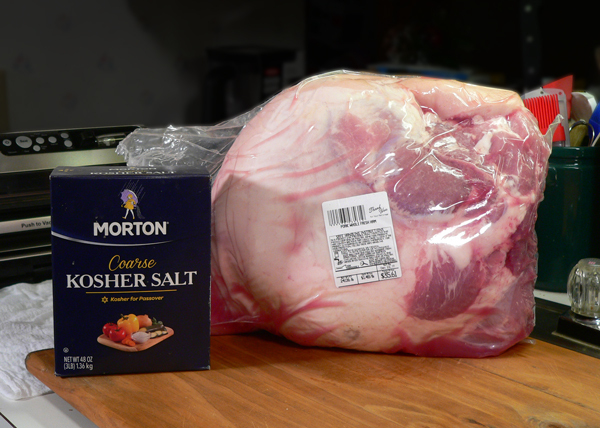 We’ll salt and brine a fresh ham for eleven days, then roast it in the oven to bring back the great flavors of the past. 2lb Kosher Salt, approximately, as needed. 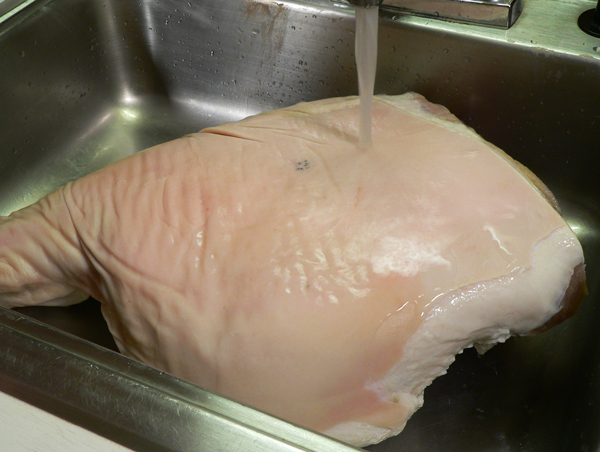 Rinse ham well under cold running water. Trim away excess fat and skin pieces. Cut incisions next to the three bones. About 3 inches wide, as deep as your knife will go. 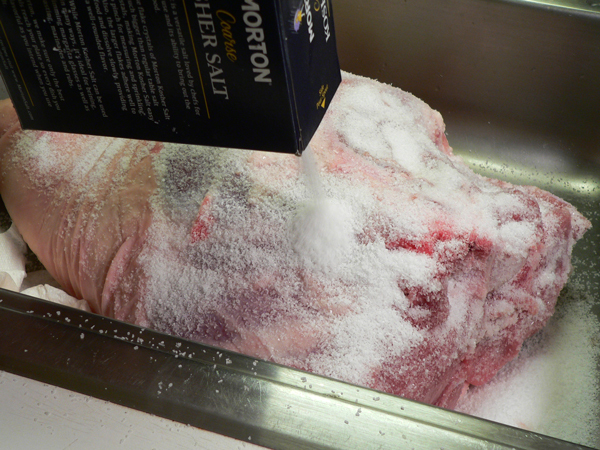 Pack incisions with kosher salt, pressing it in deep, packing until full. Place salted ham in a non-reactive pan. Glass or stainless steel is preferred. Cover again with aluminum foil. Refrigerate for 11 days, turning about every four days and draining away any liquids in pan. On day 12, remove from refrigerator. Rinse off all the salt, making sure to rinse away the salt inside the three pocket areas. Place ham in large container, cover ham with water, let soak overnight in the refrigerator. Remove from water, rinse again. Pre-heat oven to 350F degrees when ready to cook. 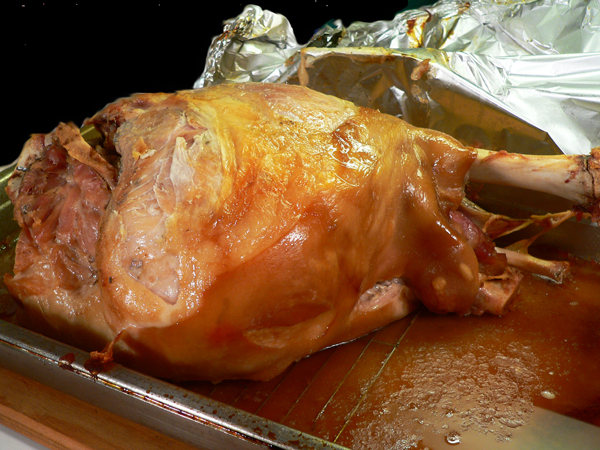 Place ham on wire rack in a large roasting pan. Cover with lid or foil. Roast at 20 minutes per pound in 350F degree oven or until done. Internal temperature should reach 165F degrees to be done. Remove cover and let brown for 30 minutes during last part of cooking process. Leftovers may be refrigerated for 5-6 days, or frozen and stored for up to 6 months for best results. Your Comments: Have you ever tried Corned Ham? Ever made one? I’d love to hear your comments on our recipe. It will only take a minute or two for you to share your comments in the section below. Remember, all comments are moderated. That just means that I personally read each and everyone before they are approved for viewing on our family friendly website. Thank you in advance for sharing. Can you show and tell how to make fried corn bread patties. My mama use to make them and when I try they don’t come out right. Ham looks delicious. Thank you for the information about the Jane Parker fruitcakes. I ordered one of each style and they were delicious. Also, the company was wonderful to deal with. They will be a part of my holidays from now on thanks to you. Stay warm and have a Happy, Healthy New Year. Looks like it’s worth the effort 🙂 Brings back memories of my childhood. Thanks for all your recipes. I’ve never tried corned ham. I think I’ll try those biscuits. I, too, am tired of this cold. I’m going to write “I will never complain about the heat again” 100 times and post it on my refrigerator to remind me of this frigid cold when the heat returns.